Yesterday I posted the recipe for my little Homemade Pop Tarts I made for all the galentines in my life. 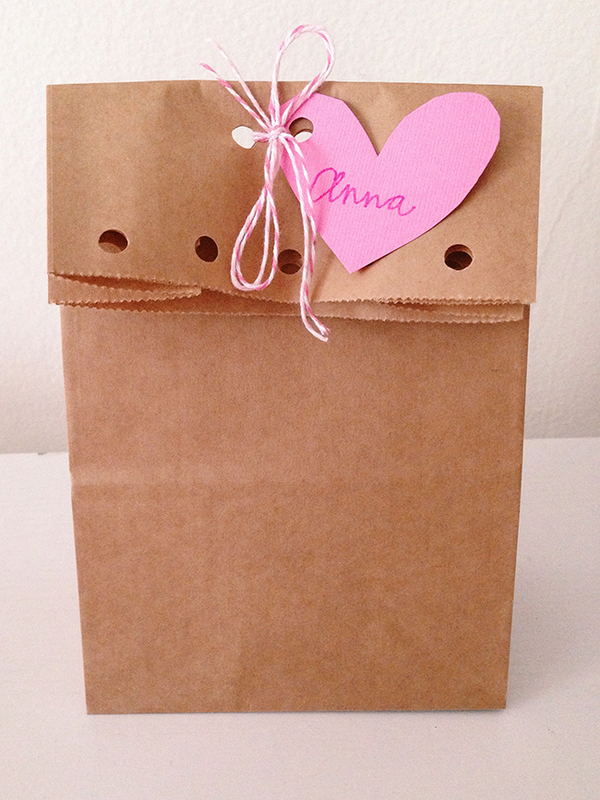 Today I'm showing the super simple DIY Treat Bag I put together to deliver them in. To get the decorative edge, punch five holes along the top of your sacks. Fill them with whatever is going inside then fold over the top an inch and a half. Punch two more holes along the top to string your twine through. Cut about a foot long piece of twine and tie a knot through the top two holes you just created. 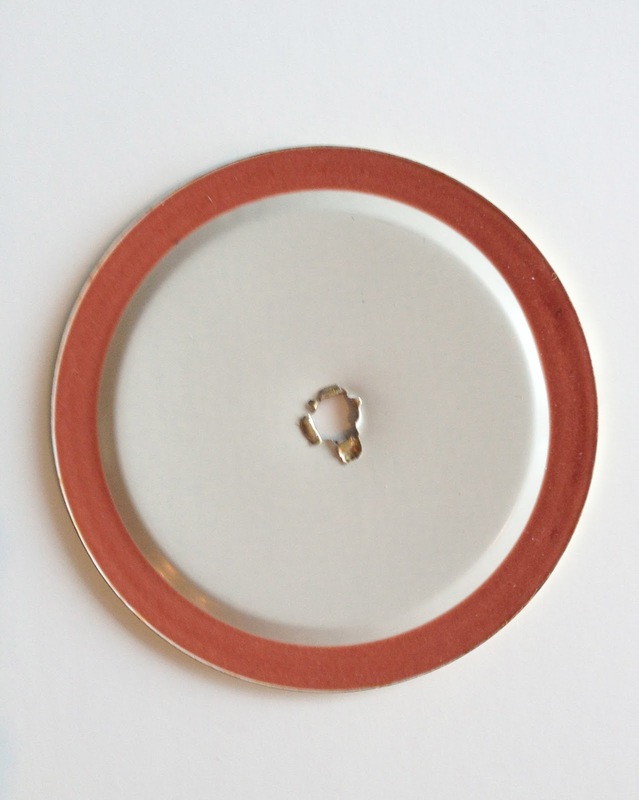 To make the tags, I used a small heart cookie cutter to trace it on the cardstock. Cut them out and punch a hole in the corner. String it on the twine, and finish with a bow! Anyone baking up some Pop Tarts or passing out Valentines today? Happy holiday weekend! I kind of hate the whole term "crafting" or "crafty" or "crafts." Thanks to the sorority world "crafting" has become a stereotypical pastime. I associate these words with new mommies or middle age women making burlap wreaths or detailed scrapbooks. You know what I mean? Those people who scour the aisles of Hobby Lobby and have a whole room devoted to "crafting." This isn't saying I don't like to be creative or making things with my hands, but the word "craft" just makes me squirmy inside. I like creative and well made things not crafty painted canvases with mushy gushy pinteresty quotes. Pardon my rant, moving on. A couple of weeks ago was one of my roommate's 21st birthday and the house was in need of a little celebratory decorations! 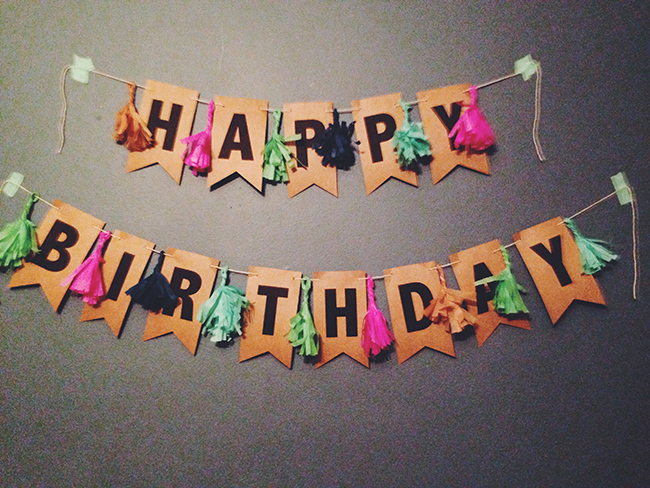 I came up with this little birthday sign and it just turned out so cute! 1. Create a word document with the page format in landscape. Using a bold block font in about a 450 pt. size type out whatever you want your sign to say. (Make the font large enough so two letters fit on each page). 2. Print your saying onto the craft paper. 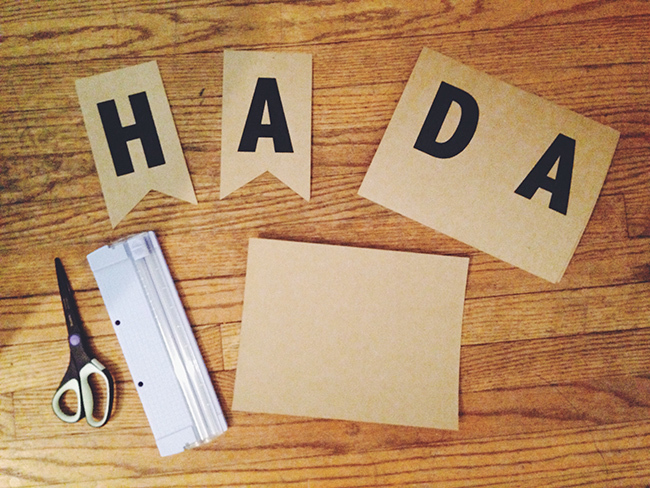 Trim each letter into a rectangle then angle the bottom to crate a pennant like design. Essentially just cutting a triangle out from the bottom. 3. Hole punch the top corners of each letter. 4. Using my instructions on how to make a tassel, create one to go between each letter. I cut my sheets of tissue paper in half to make mini tassels. 5. Now that you have your letters and tassels string them on to your twine. You can make one long sign or split each word up like I did. See below. So this isn't a craft, but instead a creative project! You can get even more creative and use this DIY for a holiday, or include someone's name, or for a shower or party! Use green and red for Christmas, orange and black for Halloween, etc. So my dad has one rule. If any of us are to ever get a tattoo we have to get two. The first can be whatever we want and the second has to be 'stupid' across our forehead. Don't worry dad, you drilled that into my head to make me never want to get a tattoo. Although, temporary tattoos are excluded from that rule. Flash tattoos have quickly been popping up everywhere. Sister Claire and I first saw them at my favorite store in D.C. Wink, (that I also mentioned here) when she was here visiting. We instantly loved them and bought a package to split. Since purchasing, I've seen them all over. The tattoos come in 9 different packages. I've loved mine and they are a great conversation starter to say the least when someone sees them. I even had a girl comment on them in my Barre 3 class in the middle of push-pulls...that was a new one. Follow along with my awkward dorm bathroom pictures as I go through the obvious steps to putting on temporary tattoos. (It seemed like a much cooler idea at the time, now I feel slightly dumb for assuming someone doesn't know how to put on a temporary tattoo). To my experience they stay on for about a solid week. They are bringing back to the whole 90's childhood thing that is resurfacing in a much cooler way. You can order your own Flash Tattoos here! I am a very spirited person when it comes to almost everything. I like to really get into things, which includes painting my nails to match whatever holiday is coming up. Red and blue on the Fourth of July and red and green for Christmas. Last year I did a similar Valentine design, but with the traditional red and pink. I'm keeping things a little more subtle this year, but still celebrating the holiday on my nails! For this nail design all you need is a good beige and white nail polish. I recently bought Essie's "Sand Tropez," and it is without a doubt my favorite nail polish I have ever had. I've had it on my nails for about 2 months. As for white, L'Oreal's "I Will" #220 is a great and doesn't come out streaky. Now for the heart. I don't use any special tools or toothpicks. Just get a tiny bit of white polish on the end of your brush and make a little angled mark, to form half of your heart. (Cue "Half of My Heart" lyrics by John Mayer.) The shape of most brushes is kind of rectangular, so use that to make the half. You don't have to make any strokes. I'm sorry if I just talked in circles and that didn't make any since at all. Repeat the step again, making an angled mark on the other direction to form a full heart! 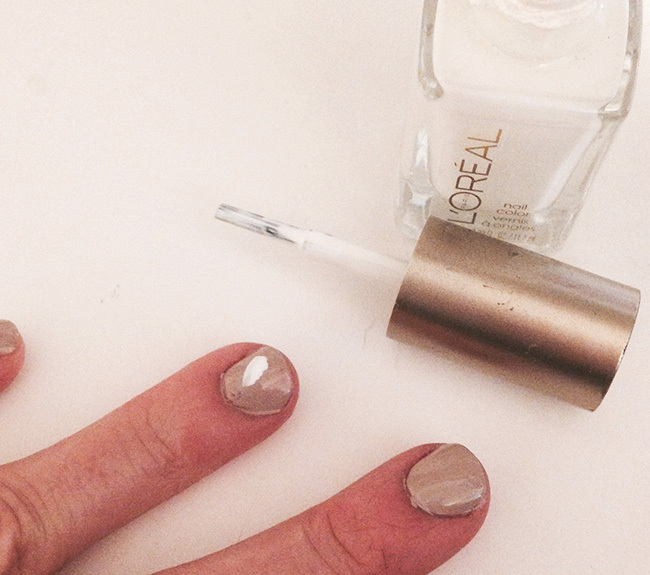 Wait for your heart to dry then top off your nails with a top coat. 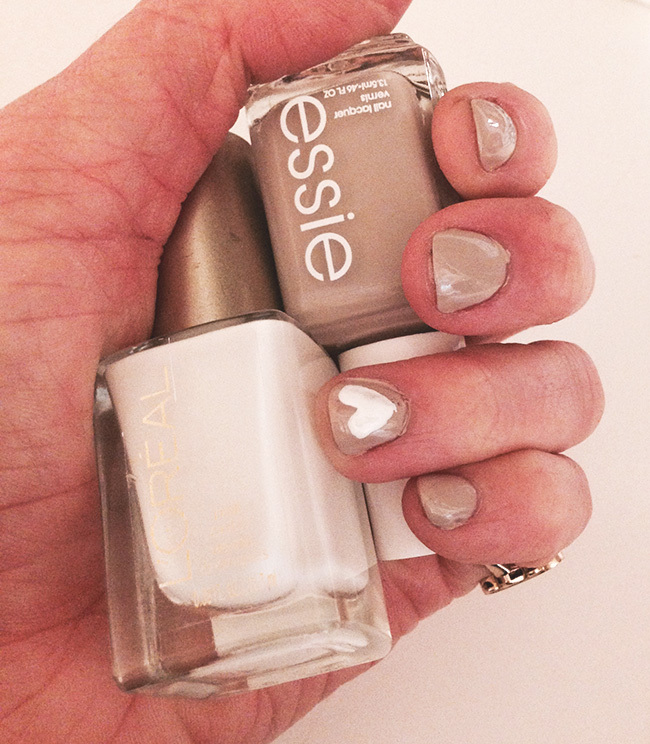 Now you have subtle but spirited little Valentine nails! I love drinking out of mason jars. The other morning I switched up my usual hot cup of joe with some iced coffee, complete with coffee ice cubes I froze the day before. 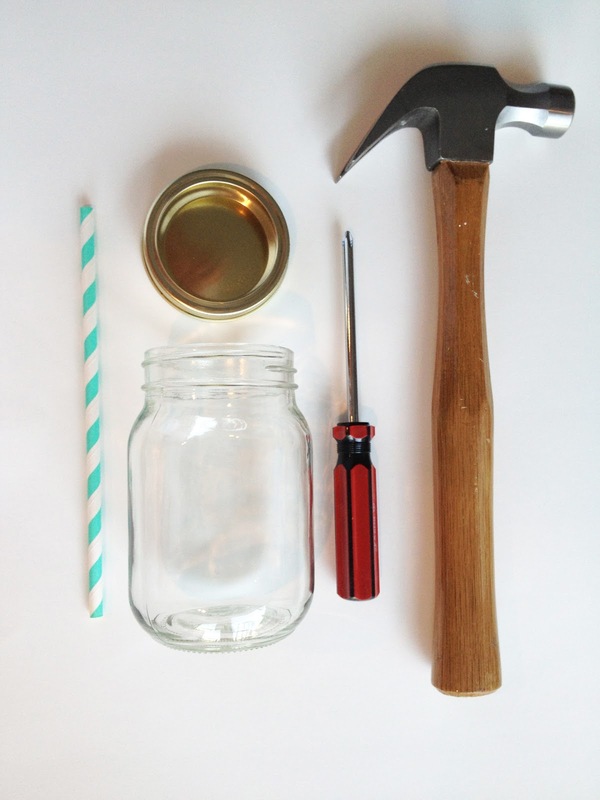 By creating a hole for a straw to go through in the lid of a mason jar, it makes for a perfect to-go cup! So efficient and easy to transport without any spillage. This DIY is so easy. I literally put it together the other morning, right before I had to leave for work. 1. 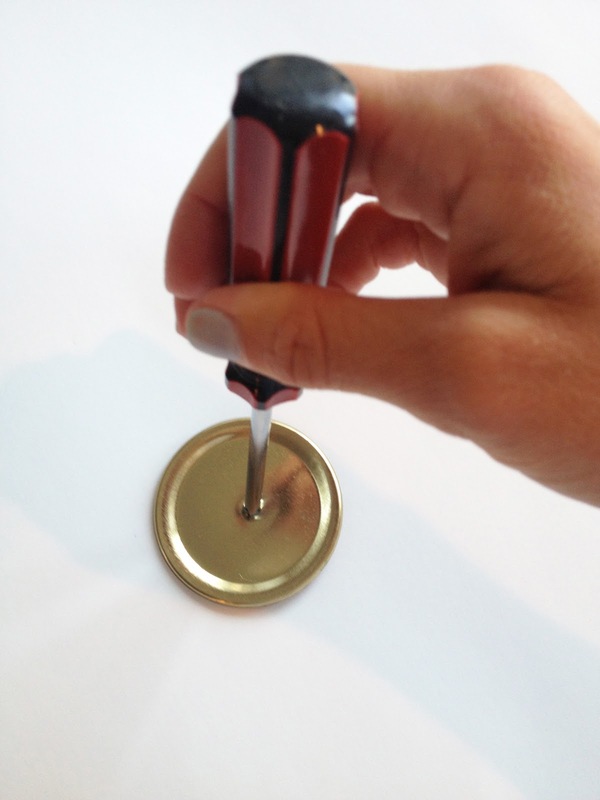 Center the screw driver on the lid and hammer to create a hole. 2. 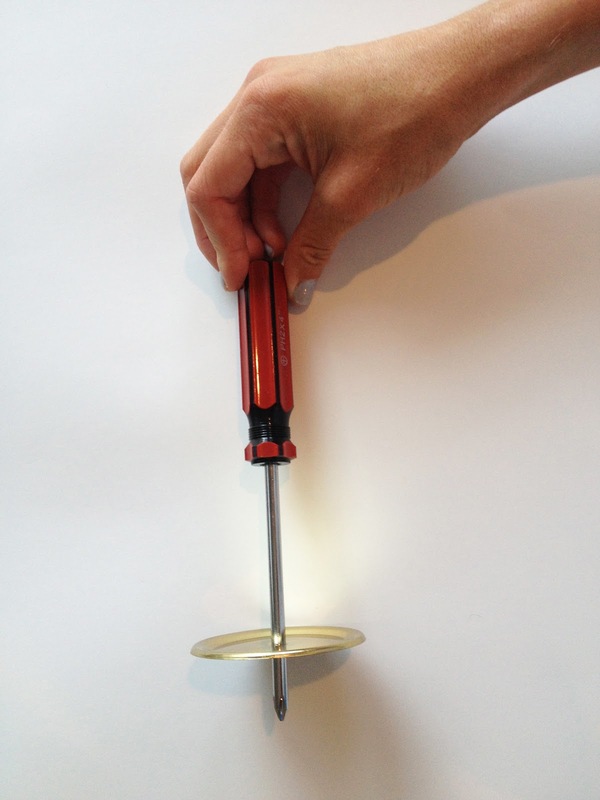 Wiggle the screw driver around until you've made a hole big enough for your straw. 3. 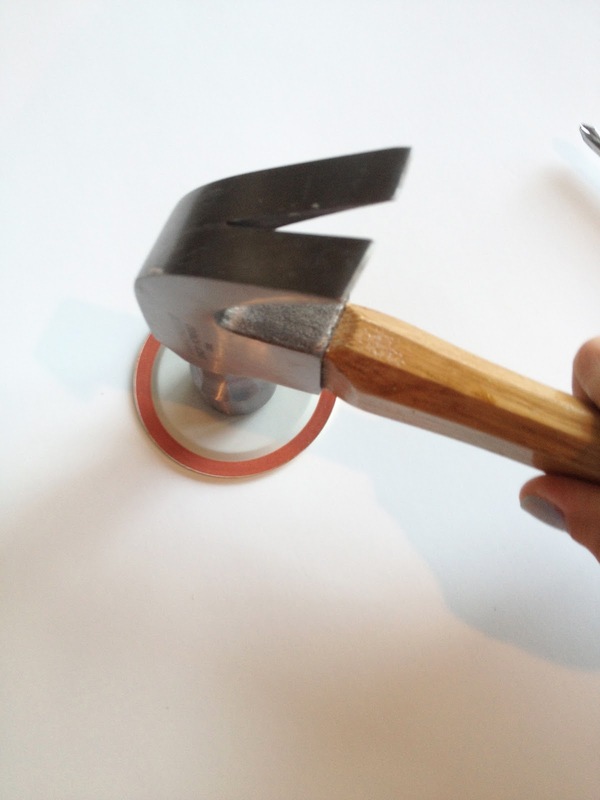 Hammer the edges down so around the hole is smooth. 4. Stick your straw through and screw on the lid! 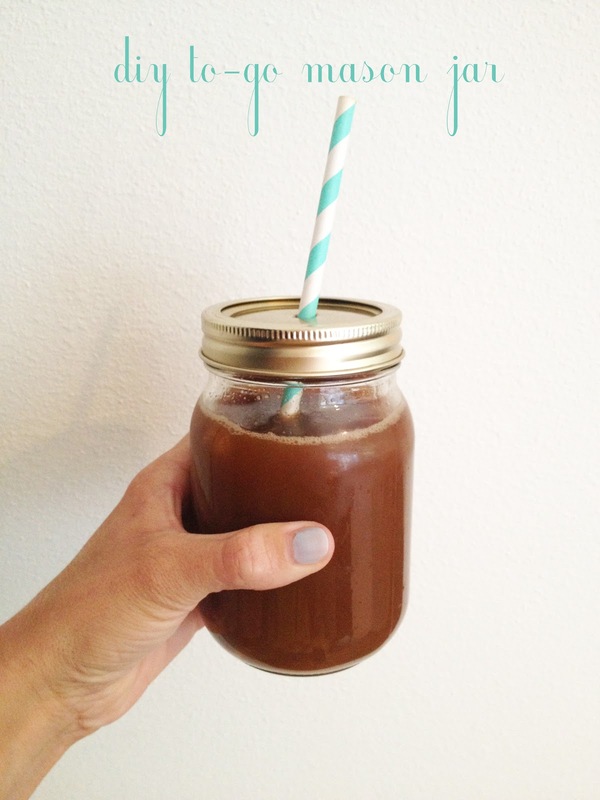 And there ya go, a to-go mason jar! I'm sad to say I'm going to take about a two week hiatus from the blog. I start prep for sorority recruitment this weekend and I'm about to be busy busy. There might be a random post here and there, but I'll be back soon with a huge "bites of my life" post to catch up for lost time!